Hello Egon, thank you for taking the time to tell us more about Walden Lakehouse. We’d love to start by hearing a little about you, the owners of such a unique home? We are Egon and Richard. I, Egon, grew up in Athlone, the nearest town to Walden cottage but have lived most of my adult life in London. I work as an interior designer and Richard is a management consultant. What makes Walden Lakehouse the perfect getaway? 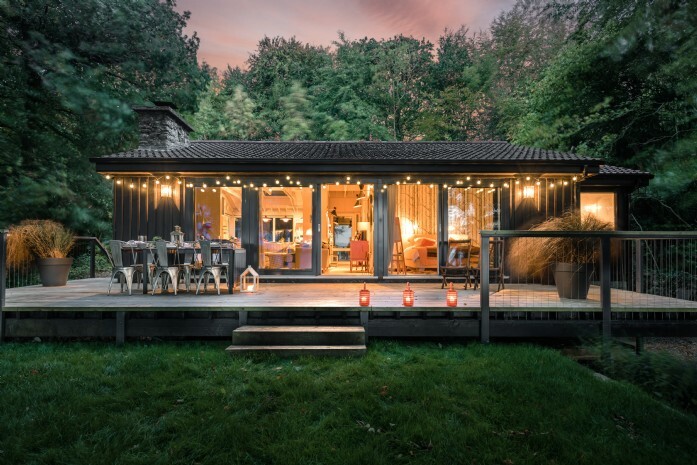 I think it’s the combination of the most perfect scenic location, nestled in woodland and looking out over the lake, combined with a super cosy and luxurious interior space. We were very conscious to create a place that we would look forward to visit each time rather than just kitting it out. It had to provide the level of comfort and functionality as we were used to in London! The property was recently crowned ‘Ireland’s Home of the Year’, how did it feel to win such a prestigious accolade? It was such a great compliment! It really seemed to find a connection with the viewing public, probably because lots of people love the idea of a cosy little cabin in the woods. We had put such a huge amount of effort and energy into creating our perfect hideaway and it was lovely to discover that other people felt the same way about it as we did. When we entered the competition, we had no idea how popular the programme was, so our “instant celebrity” status in Ireland was a bit of a surprise! Even now, we regularly get approached by people who recognise us from the programme. It has also been brilliant for my interior design business with lots of new projects arising from it. What was your inspiration behind the cool and understated interiors? It was important for me to keep the appearance of the house as I remember it from my childhood, that feeling of a modest little timber building nestling in the woods. Inside we changed a lot, from making the living accommodation open-plan, opening up the ceiling to the rafters and adding a discreet extension at the side to house the two bathrooms. In terms of the look, it made sense to have lots of original mid-century pieces given the sixties origin of the house, but we like to mix things up a bit so there are lots of contemporary pieces, along with prints by our favourite artists too. Natural textures and tones were important to reflect the nature outside but they have been livened up by some bright colours and patterns. How long has the property been in your family? My parents bought it in the mid seventies from the English couple who had built it as a holiday home. For most of the time since then it’s been used by fishermen from the continent visiting Lough Ree. How would you best describe County Westmeath to someone who’s yet to visit? Westmeath is part of Ireland’s Hidden Heartlands and it is indeed a bit of a “hidden gem”. It has the incredible river Shannon running through it, Lough Ree, one of the largest lakes in Ireland is located close by and it is because of the many smaller lakes and watercourses, that this part of the midlands is known as “Ireland’s Lakelands”. The dead centre of Ireland is located in the county (of course there is dispute about where exactly, some have it in the middle of Lough Ree, others near the village of Glasson, where there is a nineteenth century stone monument commemorating the centre of Ireland), which means it is amazingly easy to get to and visit other parts of the country. The motorway means it is only 1.5 hours drive from Dublin and less than an hour to Galway and the Wild Atlantic Way. The nearest town Athlone is rich with history and heritage, as well as being an important crossing point of the river Shannon and a vibrant shopping and leisure destination. Could you try to sum up Walden Lakehouse in three words?